(BOSTON) — To date, there are no methods that can quickly and accurately detect pathogens in blood to allow the diagnosis of systemic bloodstream infections that can lead to life-threatening sepsis. The standard of care for detecting such blood-borne infections is blood culture, but this takes days to complete, only identifies pathogens in less than 30% of patients with fulminant infections, and it is not able to detect toxic fragments of dead pathogens that also drive the exaggerated inflammatory reactions leading to sepsis. Biomarkers that report elevated inflammation are used clinically in the treatment of patients with sepsis; however, they fail to distinguish inflammation triggered by infectious pathogens from that induced by non-infectious causes, such as burns, traumas and surgeries. Now, a Wyss Institute team led by Donald Ingber reports in eBioMedicine that it has filled this void with a rapid and specific diagnostic assay that could help physicians decide within an hour whether a patient has a systemic infection and should be hospitalized for aggressive intervention therapy. The potential of this assay to detect pathogen materials was demonstrated in both animal studies and a prospective human clinical study, whose results also suggest that it also could serve as a companion diagnostic to monitor the success of antibiotic and dialysis-like sepsis therapies. The diagnostic assay is built on FcMBL, a genetically engineered pathogen-binding protein previously developed by Ingber and Michael Super, a Wyss Senior Staff Scientist who co-leads the Institute’s pathogen-detecting effort. FcMBL binds to pathogens and pathogen-released fragments, known as Pathogen-Associated Molecular Patterns (PAMPs) by recognizing carbohydrate molecules on their surface. 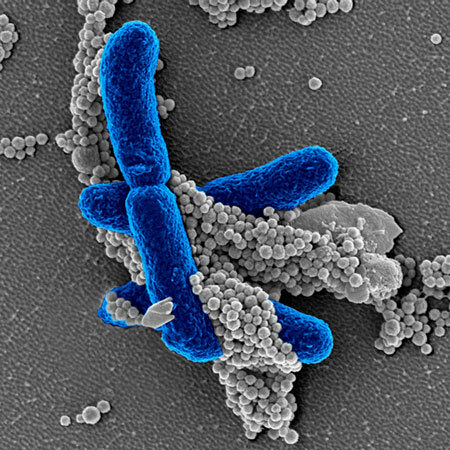 Previous efforts in Ingber’s team at the Wyss Institute have established FcMBL as a key component of an advanced dialysis-like, pathogen-extracting therapeutic device, and of a method for the fast retrieval of infectious pathogens from complex clinical samples to enable their identification and antibody susceptibilities. “In our latest work, we show that the FcMBL-based pathogen-detecting assay is considerably faster and more accurate than any other available assay for systemic infection. We are currently working to ready it for high-throughput use in clinical and point of care situations and to accelerate it even further,” said Mark Cartwright, Ph.D., a Staff Scientist at the Wyss Institute and a lead-author on the study. As a prerequisite to their clinical study, the Wyss Institute’s team had successfully tested the assay in rat and pig models of infection with pathogenic E. coli bacteria. “The animal models clearly told us that the assay can sensitively trace spikes of PAMPs released during antibiotic therapy, or residual infectious PAMP materials, even when no living bacteria circulate anymore in blood but they remain hidden inside internal organs. Thus, this assay could be an excellent tool for monitoring ongoing infection and responses to antibiotics and dialysis-like therapies for severe infections and sepsis,” said Mike Super, Ph.D. Together, the findings suggest that the FcMBL-based pathogen detection technology with its rapid handling time, high sensitivity and broad specificity towards infection-causing pathogens could provide a real-world advance to diagnose life-threatening infections in both clinical microbiology laboratories and point-of-care settings. The work was funded by the Wyss Institute and the Defense Advanced Research Project Agency (DARPA).